Heat the oil over medium heat in a medium-sized pot. Add the bacon and cook for 5-7 minutes or until browned and crispy. Remove bacon from the oil and set it on a paper towel. In the same pot, add the onion, red pepper, garlic, cumin, achiote, salt and pepper. Cook for about 5 minutes or until all the ingredients are tender, stirring occasionally. Add the broth and bring to a boil. Incorporate the lentils and bacon, and then re-duce the temperature to low. Partially cover the pot and cook mixture for 30 minutes. Add the carrots and potatoes and cook until the lentils are soft, for an additional 20 minutes. Finally, add cilantro and serve with rice, ripe plantain and avocado. The lentils do not need to soak (in advance) the night before cooking. If you don’t like bacon, use pieces of beef or pork instead. Erica Dinho Lentils and bacon is a dish that I’ve eaten all my life. When I lived in Colombia, my mom would make it at least once a week. It’s very easy to prepare. First I like to cook the bacon until it’s crispy and then I add the remaining ingredients, allowing the mix to cook slowly. 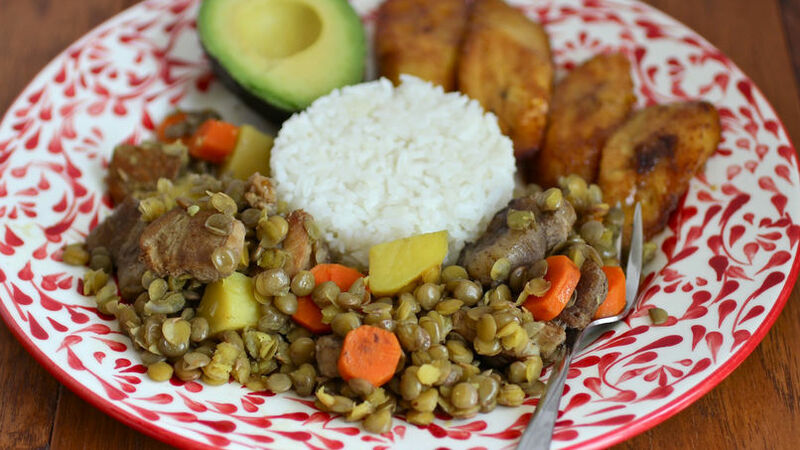 This lentil dish goes great with white rice, avocado and ripe plantains.